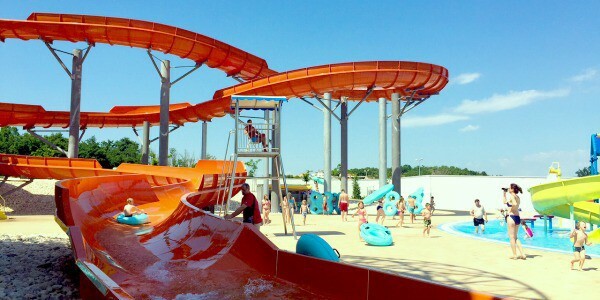 As I'm writing this post on the water park Aquacolors Porec, my legs still hurt from a crazy weekend we spent at the park with our niece and nephew. It wasn't only a visit to the water park, but three full days of fun in Porec. We went swimming to the Zelena Laguna resort (and sneaked a lot into an outdoor pool at the campsite), we also watched few sand volleyball matches at the Swatch Beach Volleyball Major that took place in Porec over the weekend, and we stuffed ourselves with yummy crème brûlée at the restaurant Petra in Vrsar (twice!). We had awesome time, but a definitive highlight was a day spent at the water park Aquacolors Porec. The water park has 12 slides, a wave pool, a lazy river, a children pool, tennis and sand volleyball courts, lots of sunbathing areas, toilet facilities, lockers, shops, bars and fast food restaurants. 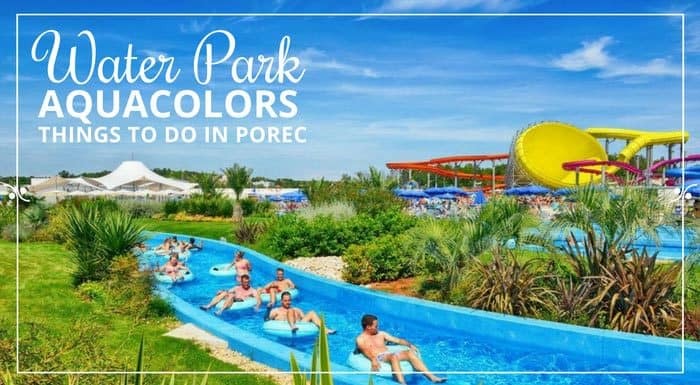 Aquacolors Porec feature in total twelve slides including extreme slides, family slides, inner tube slides, body slides, racer slides and speed slides. Each slide has a different color. Magicone is a crazy upright slide with a gigantic funnel-like shape. The descent is very steep and riders end up whirling the interior of a funnel with an awesome change of momentum. Minimum height for this slide is 110 cm and a minimum age is 10. You can go down in four-people rafts, minimum two persons. This is the first Magicone installed in any European water parks. My favorite slide, a family rafting is 200-m long slide with a very moderate descent, but enough over-the-edge wall time, and good speeds. You can go down in a one or two persons rafts. A dark blue slide consists of small spheres and tunnel slides in between. It offers an exciting ride as you drop down from a tunnel to a sphere where you experience the fast back and forth movement before dropping again through a tunnel into another sphere. A two persons raft ride. Black hole is a enclosed tube slide with few free falls, and high speeds. However it's not for klaustrofobic. I don't like enclosed slides. My second favorite slide, Navigator Uphill is a true water roller coaster. Hydro-jets will take you uphill just to slide you down again. A two persons raft ride. Multisurf slides are a series of 4 parallel slides where you slide down on a mat, head first. It's fun! The oldest kind of water slides, body slides are still fun. The path is gentle. One of the most exciting slides in the entire park, freefall slide offers almost a vertical drop. Great thrills and high speeds. A looping rocket water slide starts in a rocket-looking capsule. The operator simply moves bottom under your feet, and you slide almost under 90 degrees. A looping rocket slide is enclosed. There are two looping rockets slides (one next to another) at Aquacolors Porec. Space Boat uses tubes and rider ends up whirling the interior of a circle. Turbolance left me with a big bruise as I tried to slow down the raft. It shares a platform with a space boat. Turbolance is an extreme slide that starts with a steep drop down, just to propel you uphill and then down again. Wave pool is located at the far end of the park, opposite of the entrance. The pool is 2.700 m2 big, and as it name suggests, produces artificial waves every hour or so. We found it quite fun when the waves start. However, for some reason, the bottom of the pool has already started pilling off (and the park has just been open for a month or so). Hopefully they will fix this issue. There are lots of deck chairs and sun umbrellas around the pool, and they are free of charge. Scheduled entertainment with music takes place at the pool at certain hours. Located at the entrance of the park, a children pool is a shallow pool with couple of attractions for small children: Kid's Tower, Mushroom and a Turtle slides. A 3-meter wide, and 500-meter long, the Lazy River meander through the park. A slow current allows you to gently ride on your raft through the river. You can enjoy the Lazy River in a single or a double raft. Excellent place to refresh and relax (unless kids start making races in the river; I'm guilty of doing it). Deck chairs, lockers, and sun umbrellas are free of charge. You can pay with all major credit cards (Visa, MasterCard, Maestro) and with cash at the entrance. No cash in the park. Instead when purchasing your entrance ticket you are offered a chip bracelet for a 50 kn deposit. With a bracelet you can use lockers, and additionally you can make payments at the outlets in the park (food, drinks, souvenirs) if you initially place an agreed amount of credit. However, the final balance is made upon leaving the park. If there is any surplus left on the bracelet, the monies are refunded. Bring light water shoes that you can wear at all times. The paving gets burning hot, and my brother-in-law suffered burns to his feet. We visited the water park over a busy weekend in June. And we haven't waited in lines for long time (except on Magicone a little bit). However, I expect that in a high season the wait can be considerable, as you first need to pick up a raft (if there is any available), and then head for a slide. Water in the pools and slides is heated when needed (early and late season). When we visited we were able to bring our bags in. We were allowed our food and drinks in the park. We found this absolutely great (hate when they force you to but expensive fast food on-site). WiFi in the park is available and free of charge. Use lockers! They are free of charge, and really handy. Aquacolours is the first water park in Porec, and the second in Istria (Istralandia is the first one). 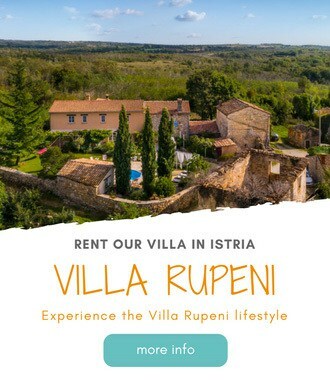 The water park is located near the Zelena Laguna resort, at the south end of Porec, on the main road Porec – Vrsar. The park is easy to reach, and it has a large parking lot. What's your experience of water parks? Have a question? Let us know in comments below.